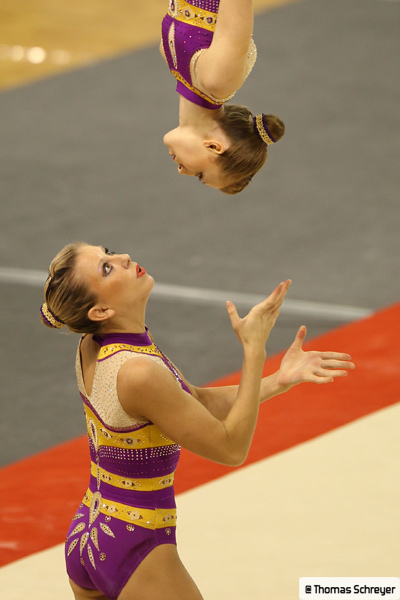 The balance routine: pairs must carry out six collective elements, three of which must be held for three seconds. The men’s and women’s groups must perform two different types of pyramid, with three holds lasting three seconds. The dynamic routine: the gymnasts must carry out at least six dynamic collective elements, at least two of which must include a catch, in other words the ‘flyer’ must land on the partner. The combined routine: the requirements of the combined routine are a mix of the two other routines. The gymnasts’ performance must include at least six elements, comprising three balance elements held for three seconds, and three dynamic elements, including one with a catch.